Welcome to the Region 3 Web page. I currently teach elementary, middle, and secondary social studies methods courses at Western Illinois University in Macomb, Illinois. I have taught at various levels for over 35 years and feel very strongly about the importance of teaching social studies in today’s schools. The NCSS Standards, the Illinois Learning Standards for Social Science and the Common Core State Standards for English/Language Arts along with the C3 Standards give us the direction and purpose for providing students with an environment through which they can become active, engaged citizens. As you will notice, this page is somewhat a work in progress. Please contact me with information that you would like to see added as I am always wanting to expand our page. Do you know someone who would make a great teacher? The Woodrow Wilson Teaching Fellowship is an unparalleled opportunity for your students, friends, or colleagues who want to use their math or science knowledge with the young people who need them most. For top applicants, this prestigious Fellowship offers a generous stipend ($30,000) toward completion of a master's degree program at a Woodrow Wilson partner institution in Georgia. Fellows prepare through a yearlong clinical experience in a local high-need school, along with rigorous subject matter courses, then commit to teach for three years in urban or rural secondary schools, with mentoring throughout the entire process. The most successful Woodrow Wilson Teaching Fellows come to us through a recommendation from a trusted source--a professor or colleague like you. By forwarding this email on to a potential Fellow, you will not only expose that candidate to a rich educational opportunity, but also help the students whom that person will one day teach. Thank you for giving this opportunity some thought. We look forward to hearing from any candidates you can refer to us. If you know of additional exhibits that should be added below, please contact me, Barry Witten (BL-Witten@wiu.edu) or the ICSS Webmaster David McMullen (mcmullen@fsmail.bradley.edu). The River Valley Gallery- Explores the character of the Illinois River and traces the interaction between the river and the people who lived along it from the end of the Ice Age to the present day. The story is told through innovative displays and Legacy, a large-screen video production that captures the panorama of the past and leads one to a real-life view of the river valley today. Reflections on Three Worlds- Reveals the world of Mississippian people whose 800-year-old sites surround the museum today. The exhibits depict the complex life and culture of these people, trace in detail the evidence of archaeology, and lead to a spectacular multimedia event that takes one through a kaleidoscope of sights, sounds, symbols, music and voices of the three worlds of Mississippian belief. Illinois River Bison Discovery The partial skeleton of a bison found along the banks of the Illinois River is featured in a display about recent excavations at a bison kill site located south of Peoria, Illinois. This discovery represents the earliest evidence of bison hunting in Illinois. Radiocarbon dates of the bones place the kill at about 400 years B.C. Heretofore, bison populations were not thought to have arrived in the Illinois country before 1500 A.D.
Agriculture has always been an important aspect of Pike County, and the PCHS Museum has items representing Pike's farming history, including a seed plow and wagon. Local businesses are also represented with special items highlighting their own history. 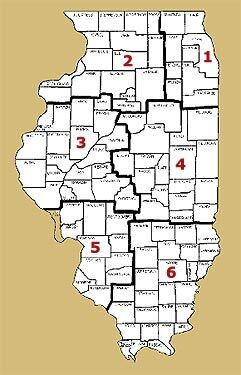 Many famous individuals are associated with Pike County, including Abraham Lincoln, Stephen Douglas, John Nicolay, John Hay, and Free Frank McWorter. Items connected to these 19th century figures are presented within the museum. The museum has on display a pair of Robert Earl Hughes' overalls. Regarded as the heaviest man who walked the earth, Hughes was a resident of Fishhook and is buried not far from this small hamlet in northern Pike County. We hope you stop by and take a tour of the PCHS collection. The museum is open Wednesday through Saturday, 10 am until 2 pm. To arrange for private or group tours, please call the museum office. John Greene Shastid's grandson, Dr. Thomas Hall Shastid, provides us with a unique look into Abraham Lincoln's relationship with the Shastids and other Pike County families in his book My Second Life. John Shastid and his family knew Lincoln from their days at New Salem. They often visited his store and conversed with him on everyday occasions, much like any other member of the community. In January 1836 John Shastid moved his family from New Salem to Pittsfield. There were then only six houses in the little county seat, one of which Shastid purchased for his family. In 1838, Shastid built, with his own hands, "a considerable larger white one, a house that still stands and in which a quite remarkable person, though then unknown, was nevertheless on several occasions an honored guest. Abraham Lincoln, that is to say, although he still resided...in Sangamon County, not infrequently, as a circuit rider, made trips to Pittsfield on legal or other business." 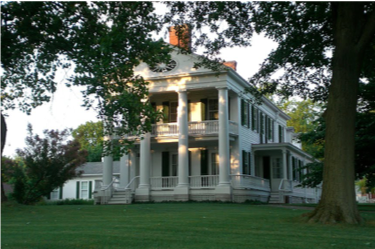 Visit the Mansion to see the home John Wood built to replace his two-story log cabin. 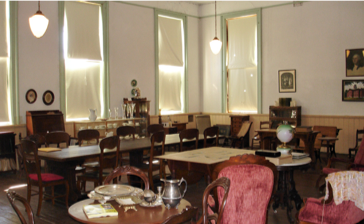 Hear stories of life in the early 1800’s and learn about the man who founded Quincy. The world is full of stories about brave heroes, magical events, and fantastic beings. For thousands of years, humans everywhere - sometimes inspired by living animals or even fossils - have brought mythic creatures to life in stories, songs, and works of art.